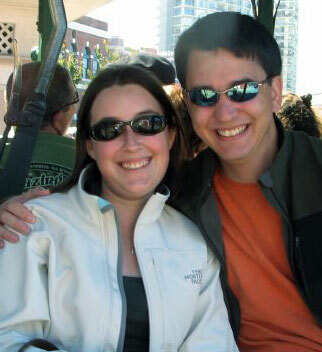 Matt and Angela are a married couple who live in Alexandria, VA. During the day, they’re both engineers. At night, he cooks and she knits. The first time Matt really cooked anything difficult was Fettuccine Alfredo to impress Angela. From then on, he’s kept on trying to cook things to impress her. This is the story of that effort. Thanks, Matt, for posting the recipe for Chicken Pot Pie. I discovered it when googling “chicken pot pie with homemade noodles”. We are preparing to move, and I had packed this recipe but wanted to make it tonight for my family. I, too, grew up with my grandmother cooking this for my family at holidays and special occasions; I would always request that she make pot pie on my birthday. Her recipe is a little different but with the same premise. She would use a whole chicken to make the broth, then remove it, shred the meat, and add it back in the pot. She did not add potatoes, either. However, I do know the origin of her recipe. It was given to her by her mother-in-law whose French family settled in Michigan by way of Canada in the late 1780’s. My grandfather had grown up eating it, and when they were married my grandmother continued to make it for him. We always called it pot pie as well, even though it is not what we think of a traditional pot pie as being, as you’ve pointed out. My grandmother died 16 years ago, and a couple of years ago I decided to surprise my father and make it for Father’s Day (he was her only child.) He loved it! And ate three large plates full! Thank you again for sharing this well-loved recipe. I’d love to send you the question for our next Monthly Mouthful at Chew on that Blog (http://www.chewonthatblog.com). Can you send me an email where you can be reached? Thanks! So what do you like about cooking? I think it is safe to say your site is going to appear on my blogroll and that the lucky two and a half people who visit my site will be clicking on it to see what you have to offer next. Have got to link with you guys – keep the blog going in 2008! Thanks. I appreciate it even if I doubt there will be any votes. All I can say is wow…..homemade bacon?? yum. I’m an avid cook (at night also) and am always looking for new things to try- lately I’ve been on Indian with a brief foray into cheese making…but the meat curing sounds like great fun! I just discovered your blog accidentally but I will be checking on it from time to time, can’t wait to try a few of your recipes! Thanks! Hi guys – just thought I would let you know of the following award…. Not quite sure how to paste it into this box! Lunes, thanks for the kind words. Nice blog 🙂 will keep coming back ……..
GET OUT! You live in Long Beach! I read this AFTER I had posted on your Cinnamon Pound Cake page. We have a great city, don’t we? I am also going to visit Farida’s blog. Have you posted your recipe for pickled beets? They were amazing!!! Found your blog today and I really enjoyed it. It felt like you channeled my own food likes and dislikes. I have a question…I have a “mock” Porchetta resting in the fridge right now (Per the Zuni Cafe recipe). I had a crazy idea….do you think I could cook it on my Showtime Rotisserie? Hey, I know it’s a corney deice, bit what they heck…it might be a better way to cook it…what do you think? I don’t see any reason you couldn’t cook it in the Showtime Rotisserie. You may have to adjust the cooking time, however.